A Little Princess by Frances Hodgson Burnett. First published in 1905. I think I was ten or eleven years old when I first read this book. Recently, when I wanted to re-read it, I was delighted to find this old Puffin paperback copy with the wonderful spiky, smudgy illustrations by Margery Gill that I remembered from first time around. They seem to fit perfectly with the story. That may be because pictures and story fused together in my imagination on first encountering both; or just because that is what the best kind of illustration does – enters into the essence of the story and embodies it. Sara Crewe, the princess of the title, is an ‘odd-looking little girl’, reserved and quaint. Thin, with short black hair and green eyes, she thinks – mistakenly, yet without much angst – that she is ugly. 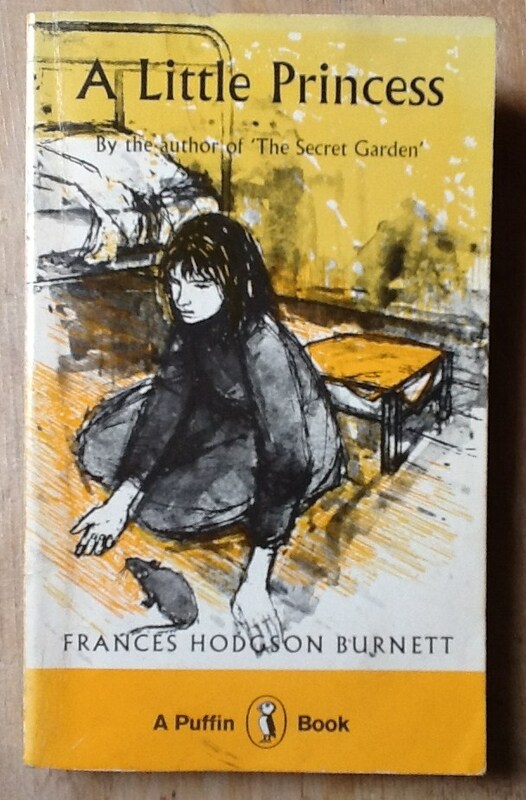 Sara knows that beautiful girls are the ones with ‘dimples, and rose-coloured cheeks, and long hair the colour of gold.’ She reminds me of another of Hodgson Burnett’s creations, Mary Lennox in The Secret Garden. Like Sara, Mary was born in India; she is thin, sallow, and ‘everybody said she was the most disagreeable-looking child ever seen’. Our heroine is not at all princessy, then, in the way we think of it now. And Margery Gill’s pictures convey Sara brilliantly: her awkwardness and her appeal, her nature which is both stoical and optimistic – and stubborn! When Sara’s circumstances suffer a dramatic change the illustrations pull no punches. Gill’s scratchy style is well-suited to grim and grimy surroundings, to haunted and hungry faces. Gill’s illustrations for A Little Princess are still available in a recent Puffin Classic. There are various other editions of this book about, many with covers which don’t do Sara and the story justice. One shows three snub-nosed, well-fed, well-dressed cartoony girls – presumably Sara, Becky and Ermengarde in the attic. All the grime, grit, and worry hygienically disposed of and replaced with cute. Because that’s what a princess is. I think we need a few more ‘solemn’ drawings of children, please. For me, Margery Gill’s drawings will always epitomize A Little Princess.